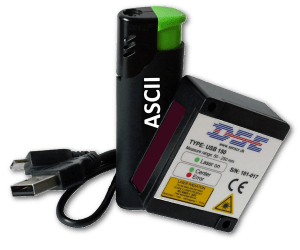 The brand new USB 150 sensor is an Optical Displacement Sen­sor using advanced laser tech­nique, a line scan camera and digital signal processing algorithms. Sized smaller than a disposable lighter, measuring only 48 x 40 x 19,5 mm and weighing 55 gr. makes this very compact sensor easy to fit and easy to place. The advanced electronic and camera is well protected by a solid aluminum body. USB 150 is introduced with a 200 mm measuring range (50-250 mm). The sensor uses a standard USB interface for Windows as well as Unix environments. Cables are fitted with a micro-B connector at the sensor end and a USB-A connector at the other end. The measuring frequency is 1 kHz and the sensor operate either in BINARY MODE, with 3-byte telegrams, and a nominal resolution of the converted integer number of 0,01 mm, or in ASCII MODE, here a baud rate of 115200 baud is needed for operating at the full measuring frequency of 1 kHz. A special feature of ASCII MODE is that by sending a capital “Q” a single measuring value is presented. See Data sheet for further details about specifications and this protocol. The applications where the USB 150 sensors can be used are innumerable. They extend from laboratories to food-, medical- and car industry as well as all kind manufacturing – simply wherever a non-contact precision measurement is advantageous. Food Industry, medical industry, laboratories, wood industry, rubber industry and car industry.